Mark Nelson was appointed Magistrate of the 14-B District Court at the beginning of Judge Pope’s first term in 2009. After 3 years of service as a part-time Magistrate, he was appointed to the position of Magistrate/Court Administrator and came to work full time for the 14-B District Court. Prior to being appointed Magistrate, he was an attorney in private practice maintaining an office in downtown Ypsilanti. 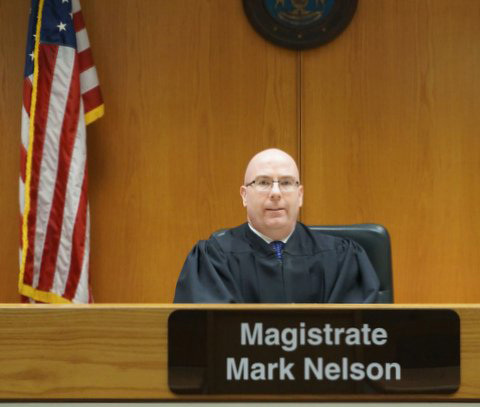 Magistrate Nelson has resided in the Ypsilanti community most of his life. He is a graduate of Ypsilanti High School. He earned his bachelor degree from DePauw University and his law degree from Saint Louis University. He and his wife Kerri reside in Ypsilanti Township and have one son attending Lincoln Schools. Magistrate Nelson assists the Michigan Judicial Institute with training of new magistrates by hosting them in his courtroom for observation and practical training. In addition, he contributed to editing of the most recent version of the Michigan District Court Magistrate Manual. He also currently serves on the board of the Michigan Association of District Court Magistrates. As Court Administrator, Magistrate Nelson has advanced the Court’s technology and has been instrumental in acquiring grants for the Drug Court specialty docket. In 2012, Magistrate Nelson oversaw the Court’s conversion from its outdated case management computer system to the state standard for case management, the Judicial Information System. This allows online payment of tickets and automated upload of citations from law enforcement agencies among other benefits to the Court and the public. In 2013 the Court applied for and was awarded grant money to deal with drug addiction and human trafficking. This docket has been very successful since its inception.